We are an Automated Talent Acquisition Company. With our Acclaim solution, we provide a comprehensive recruitment platform from sourcing to onBoarding. 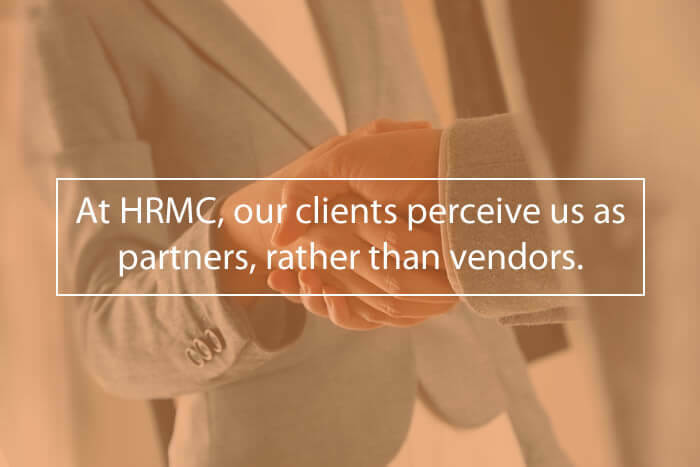 We have dedicated more than 32 years towards innovative, award-winning human resource solutions which ultimately developed into the industry’s premier Talent Acquisition platform, HRMC Acclaim. Our founder is Ron Selewach, a graduate of Cornell University’s prestigious School of Industrial and Labor Relations. Ron’s success in human resources for Fortune 100 companies led him on a path of discovery: there had to be a better way to manage redundant tasks associated with recruitment and employee retention while improving the quality of the candidate experience, increasing the accuracy of the evaluation process, and turning the HR department into a recognized revenue generator. He founded HRMC in 1984 and has been turning that dream into reality ever since, continually pushing the boundaries of what’s possible and surpassing client expectations. Exceptional customer service has been a company standard from day one. We are passionate about our customer service focus, and believe that this aspect of client experience is integral to the value of our products and to our identity as an organization. A prominent financial institution requires that ALL candidates (from C-Level to hourly) be routed through HRMC Acclaim, for all aspects of the preliminary screening process. HRMC effectively conducted over 50,000 interviews in just one week for a major pharmaceutical company. If IVR is used, over 1,500 IVR interviews can be conducted at the same time – without interruption. One of the nation’s largest snack food manufacturers uses Acclaim at over 250 locations nationwide. A distinguished financial institution can now do one day hiring thanks to the Acclaim system. Our partners consider us their secret weapon – and competitive advantage in the ongoing war for talent. Our technology is transparent. Candidates are typically unaware that they are utilizing an outside company’s IVR or web system. Hello. I’m Ron Selewach, CEO and Founder of HRMC. We began our company over 32 years ago, and have gained nationwide recognition by combining advanced applications for work-flow automation with user friendly interfaces and unsurpassed customer service. HRMC has a team-inspired work environment that fosters creativity and growth. We provide our team members with the opportunity to work on cutting edge technology while setting the standard in automating HR processes. We are an independently owned company with a non-bureaucratic work environment. Our focus is first and foremost on the customer, but we also aim to make coming to work each day an enjoyable experience as well. Here you will be doing work that makes a difference for millions of people. You’ll work with smart and talented individuals, focused on cooperation and collaboration, in an environment where you are trusted to do your job well, and to create and innovate. We value our associates and provide them with a competitive compensation and benefits package in a relaxed business-casual working environment. We’re always keeping an eye out for great people! Our team has a passion for successfully partnering with our clients. We work very hard and have a strong sense of ethics. If this sounds like you, we’d love to hear from you! Please contact us at careers@hrmc.com. And again, thank you for your interest in our company. If you are an individual with a background in artificial intelligence, workflow automation, analytics, project management, web development, and data management – this may be the challenge you are looking for! If you are a person with a passion and background for the support side of a business, we are always looking for great people. Whether it’s an administrative or accounting type position, you may be interested in working with our team! Marketing and selling a “machine system” that can evaluate and process candidates can be a real challenge! If you are a seasoned and strategic individual with an extensive sales track record, this may be just what you’re looking for! Our Client Support team is extensive – from HR folks, recruiters, I/O Psychologists, Data Analysts, Interview Developers, to Job Analysts. They are all dedicated to the success of our solutions with our clients. We employ full time, part time and occasional consultants in these roles. If this sounds like you, we should talk!